RKhunter must be deployed on each server. RKhunter must be configures to generate a rkhunter.log in the /var/log directory once a day. The q-Status bin directory will automatically copy the rkhunter.log file to the q-Status web server with the other configuration date for processing by q-Status q-Alerts. This has already been pre-configured as of q-Status Linux 5.20 Update 09 or later. q-Status q-Alerts for Rkhunter is an example implementation of identify changes in output files on a daily bases. It works the same way as any of the other q-Status q-Alerts funtions and can be cleared from the q-Status Administrative GUI by generating another baseline. Rkhunter is released as GPL licensed project and free for everyone to use. Rkhunter is released as GPL licensed project and free for everyone. Documentation and full description of Rkhunter can be found at http://rootkit.nl/projects/rootkit_hunter.html. Also you may be intersted in the following article by Jon Watson https://www.comparitech.com/antivirus/best-free-rootkit-removal-scanner/. To use q-Status q-Alerts with Rkhunter must be installed and function on each server. Documentation and full description of Rkhunter can be found at https://www.comparitech.com/antivirus/best-free-rootkit-removal-scanner/. You can download the software from this site. For RedHat Linux base user, Rkhunter is also part of Source Forge and can be installed and updated from their site. Perform a "yum install rkhunter". # Update PROPUPD with comment. A simple crontab entry will execute a script to compare the most recent baselines for Rkhunter and create an alert email of any discrepancies found. The email is then sent using smtp to a users in a configurable baseline alert mailing list. q-Status Baseline Alerts requires little configuration set up to implement. Rkhunter discrepancy alerts are clear by simply generating a new baseline. If no discrepancies are found, no email baseline discrepancy alerts are sent. The email alert summarizes each host and the number warning discrepancies. A q-Status link to its web page report is provides. Clicking this link will take the user to the Root Kit Hunter "Baseline Comparison" report page in the "Discrepancies Only" mode. This is displayed as a true table stating is a warning is present. The word "true" for a discrepancy will link the user to the full report and to the exact link where this entry appears. Editing Alert.conf to added web location of q-StatusLinux. Adding email addresses to the mail_list_security.conf. 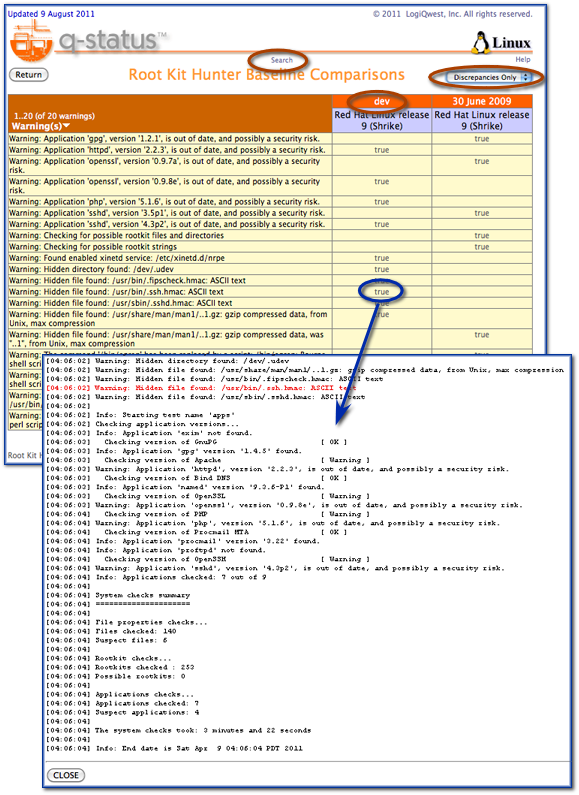 Configuring the smtp or sendmail mail program. Adding crontab entries to call to the q-Status RKhunter Alert program. You may need to configure CPAN for the server before completing the install. This is documented when you execute perl the initial "-MCPAN -eshell" options. baselineAlertLinux.pl q-Status Baseline email alert program. Set up to be called by crontab. diskAlertsLinux.pl q-Status Disk threshold email alert program. Set up to be called by crontab. 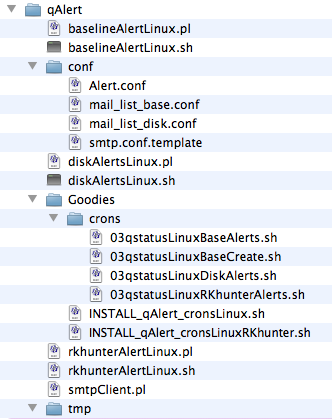 rkhunterAlertLinux.pl q-Status RKhunter changes email alert program. Alert.conf Contain entry of q-Status web location address and reports true or false parameters. smtp.conf Configuration file for smtp for access to remote mail server. Copy smtp.conf.template to smtp.conf to activate. smtp.conf.template Template Configuration file for smtp for access to remote mail server. Rename or copy to smtp.conf. INSTALL_qAlerts_cronClassicUnix.sh Script to install qAlert crontab entires in Classic Unux (e.g. Solaris). INSTALL_qAlerts_cronClassicUnixRKhunter.sh Script to install rkhunter crontab entires in Classic Unux (e.g. Solaris). INSTALL_qAlerts_cronsLinux.sh Script to install qAlert crontab entires in Linux. INSTALL_qAlerts_cronsLinuxRKhunter.sh Script to install rkhunter crontab entires in Linux. tmp scratch write area for email message. The Perl script rkhunterAlertLinux.pl, and the shell scripts INSTALL_qAlerts_cronClassicUnixRKhunter.sh and INSTALL_qAlerts_cronsLinuxRKhunter.sh are used to support RKhunter Alerts. Note: In the directory qAlert/conf copy or rename "smtp.conf.template" to "smtp.conf" and edit as described below. The Alert.conf file contains for parameter entries. The http_ref web location parameter is used for the hyperlinks displays in the email messages. It must consist an http entry for the parameter http_ref. Note that is must contain a ending slash (/). The remaining parameters are used for baseline comparison and have no effect with q-Status RKhunter Alerts. The "mail_list_security.conf" file consist of two sections. The first section defined the from-to-subject of the email that will appear when sent. Note the "FROM" and "TO" do not need to be valid email addresses. The "TO" can a group name such as "Database Group", "Production Group" or anything that may be appropriate. The from also does not need to be a real email address such as "qstatus alert" or "Server Monitoring". The "SUBJECT" parameter will display in the mail subject line of the receiver. separated by a bar (|). You may comment out an email address, by enter in a pound (#) at the beginning of the line. This email address will not be processed. Both Note and Name are not used for the email. USER mail server login name. Setting this value to NULL, specifies that the mail server requires no password or userid to be accessed to send mail. MESSAGE_DIR tmp/ temporary directory where email message is written. Do not change. TRUE - displays mail debugging messages and sends mail. NOMAIL - Run discrepancy report without sending mail. Results displayed on screen. # When MAIL_METHOD is set to unixmail, USER and PASSWORD are ignored. #               FALSE  - the default setting when configured correctly. #               TRUE   - displays mail debugging messages and sends mail. These setting are the same that you set up for a email program on a computer. Check with the mail administrator or provide to obtain the correct values. Note: Using MAIL_METHOD equal 'unixmail', it is assume that the q-Status Linux Web server has been configurate properly (e.g. mailhost) to support a sendmail process. q-Status Linux RKhunter Alerts will only generate email if there is a change from the previous RKhunter report collected as a baseline. If no discrepancy exist for any of the rkhunter report comparisons, no email will be sent. Therefore to test the alerts, one may need to create a rkhunter report discrepancy. Say by editing an existing rkhunter file (e.g in data directory <hostname>.rkhunter) . q-Status Linux RKhunter Alerts can then be tested by simply running the rkhunterAlertLinux.pl Perl script from the command line. FALSE - the default setting when configured correctly. TRUE - displays mail debugging messages with mail. Run discrepancy report without sending mail. Results displayed on screen. If the smtp mail seems to not work correctly or there is general failure, edit the "smtp.conf" file and change the parameter "VERBOSE" to 'TRUE". Now when "baselineAlertRKhunter.pl" is run, results, outputs and email server dialog will be displayed at the command line. This maybe useful to locate configuration errors. q-Status Disks Alerts will only generate email if a threshold has been exceeded. If there is no threshold is exceeded, no Disk Alert will be sent. q-Status Baseline Alerts require that baselines be created and updated on a regular bases. If no baselines exist for a specified server, evaluation of that server will not be processed and no email will be sent. Many mail servers support a security check where the "USER" and the "FROM" entry must be the same. If not mail is send when tested, try assigning these values to be the same. INSTALL_qAlerts_cronsLinuxRKhunter.sh -Script to install qAlert crontab entires for Linux web server. INSTALL_qAlerts_cronClassicUnixRKhunter.sh - Script to install qAlert crontab entires in Classic Unux (e.g. Solaris web server). Running this scripts as root wil not only install the qAlerts crons for baseline and disks, but will also install the crontab to generate new baselines every week. "INSTALL_qAlert_cronsLinux.sh" will places entries in the cron.weekly, cron.daily and cron.hourly directories for Linux. This scripts calculate the location of the q-Status Linux Web server and create cron entries to call the Perl Scripts. q-Status RKhunter Alerts contain a flag associated with the summary of each alert. The values are "Warning", "Alert" and "Critical". Since it is highly subjective as to what this means, q-Status uses a special method for this classification. For each RKhunter discrepancy, each list of servers has a maximum number of discrepancies found per server. If the maximum number is less than 3, all discrepancy flags will be considered a "Warning". Above or equal to 3, the maximum discrepancies is divided by 3. If the number of discrepancies falls in the first third, it is considered to be just a "Warning". If it falls in the second third is an "Alert" and the last third it will be considered "Critical". q-Status Alerts is a new function to q-Status. Feedback to q-Status Alerts is always welcome. LogiQwest would really appreciate suggestion. Request for Enhancements to the alerts is alway welcome. LogiQwest also provides custom implementation of q-Status technology on a time and material base. For any effort where LogiQwest has performed the development, LogiQwest supports the life cycle of the program, maintain it and make sure that it will run with all future revision of q-Status.